This kit comes complete with everything needed for most all Gen III Hemi's that require 58-60 psi fuel pressure (which is what all production Gen III Hemi's require). You have to furnish a 3/8 supply from your tank and a 5/16" return . We do Carry special fittings to size down our 5/16" to 1/4" return. This kit works with sending units we offer for most popular applications that have a 3/8" supply and a 1/4" return. Kit comes with High Pressure Frame Mounted Walbro fuel pump and hardware. Fuel Pressure is controlled by the fuel pressure regulator filter assembly. Most all fittings are late model production push lock fittings , just like all the late model vehicles on the market. Furnished supply line has a silicone jacket for heat protection. Kit comes with ample 250 psi 3/8" F.I. Hose & 300 psi 5/16" F.I. Hose that can stand the ethanol fuel available today. As long as you have a tank with a 3/8" supply and a 5/16" Return along with a production Gen III Hemi, everything is here. *Inline High Pressure Walbro Frame Mounted Fuel Pump and Mounting Hardware. *F. I. 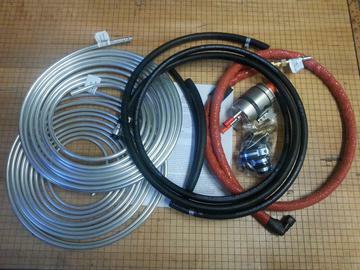 Fuel Hose 5/16" & 3/8"